Very rare to find and in very nice condition. The Red Bird is on every piece. The punch bowl is approx. This is a Stunning Hafbauer's German Crystal Punch Set! Nachtmann Crystal. The punch ladle is not original to the set, but it is also made in Germany - by Kayser. Punch Bowl is 11” high with lid. Heavy cut crystal pattern of fans, cross hatches and stars. Attractive "Heavy Crystal-Floral-Punch Bowl Stand / Vase"
5-1/4" tall x 5" diam (Punch Bowl Stand) or 6-3/4" diam. (Vase Rim) in Excellent Condition. MAKES INTO PUNCH BOWL/ SALAD BOWL/CHIP AND DIP/ CAKE PLATE NEW IN BOX. Parliamo Italiano. Hablamos Español. Salad Punch Bowl Crystal Clear Fruit Salad Soup Serving. Platter 20 1/2" Wide. Large Punch Bowl 13" Wide x 7" Deep. Antique Diamond Cut Lead Crystal. Vintage lead Crystal Pressed Glass Pedestal compote or punch bowl base. Excellent condition with no chips or cracks. Measure 7.5" tall. Ruffle edge is 7 1/4" wide. Smaller round edge is 4 3/4" wide. A unique piece! What you see is what you will get. Please view all photos carefully for details. Email ANY questions PRIOR TO purchasing. This item is sold as is, no returns, so it is very important to ask any and all questions before purchasing. Thanks for looking! 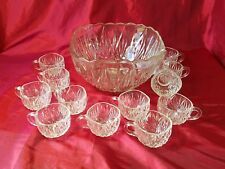 Crystal Moderno Riekes Hand Blown 1 7 pc Punch Bowl Set. There are one or two bubbles in the glass bowl which must have happened when the bowl was blown. Stunning Simple Elegance Punch Bowl Set. Serve your guests in style with this modern Punch Bowl Set. This pattern was made both cut and uncut and this set is of the better Cross Hatch cut version. This is a rare opportunity to acquire a flawless set of top-of-the-line cut crystal to add opulent elegance to your next event. Like New condition! This pattern is very similar to La Scala, but has a slightly different handle and a more rounded bottom of the cup. They are close enough they could easily be used together. Heavy lead crystal. 6 5/8" tall and 9 3/4" across top. FREE Trial ! Very Good Condition! Also made in poland. The bowl is Polonia 24% Hand Cut lead Crystal. This set is mis matched but go together beautifully. Crisscross pattern with thumbprints around the top. This glassware has an affordable "cut" glass look that most households can afford. In the 60's, the prized pieces in this pattern ranged from the beloved Punch Bowl that was seen at every Bridal or Baby Shower --all the way to pieces used more commonly on the table like the Salt & Pepper. Beautiful Shannon lead crystal punch bowl, Designs of Ireland, 24 % lead crystal made in Slovakia. Excellent condition. Wonderful and huge vintage crystal compote punch bowl. Large at approximately 11 1/2 inches wide by approximately 8 1/2 inches tall. In excellent condition with just a few scratches at bottom from moving over the years. Very classical in design with a design that compliments many crystal patterns. Heavy!! Vintage Nachtmann Crystal Footed Punch Bowl Set, W/ Ladel & 8 Cups, Nice! Manufactured fromFranz Wittwer, KG Glashüttenwerk, Brühl, North Rhine-Westphalia - Western Germany. Beautiful "ring" to this gorgeous ice bucket when tapped.Has the original sticker still attached that state:WITTWER Echt Bleikristall (Genuine Lead Crystal), Handgeschliffen (handpolished), Made in Western Germany. This is a beautiful punch bowl set, all glass including ladle. The bowl is stunning, large mid century style glass. The lady I bought this from said the vase was the base. I can't imagine perching the punch bowl on top of it so I would say it's more likely a matching vase. She also said it was an "authentic Jamaican Rum punch bowl" but I don't see anything that says that so I can't say if it is or isn't. Classic and elegant Shannon crystal. -Elegant coffee mug. -Beautiful high and fine crystal. Crystal Punch Bowl - holds 6 quarts, is 7" tall with a 11.5" opening. Estate Find. If you like crystal that is uncut with a more contemporary design, you will love this sleek, elegant set. 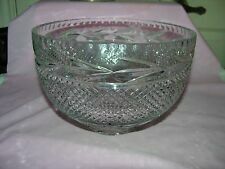 HUGE RARE ESTATE FIND THUMB PRINT CRYSTAL PUNCH BOWL & LID ~WOW FACTOR! This is from an estate sale. It just shines in the light. The pictures do not do it justice. I don’t know who made this, I can’t find another one like it. There is one issue with it. It does have a rather large chip on the rim inside, it is not visible from the outside. VINTAGE LARGE HEAVY CUT LEAD CRYSTAL FRUIT,PUNCH BOWL . Shipped with USPS Priority Mail. Hand Cut Crystal Punch Bowl Poland 10" Sticker The punch bowl is in excellent condition. Has sticker. Beautiful Crystal punch bowl with 12 matching glasses. Also includes 11 plastic hooks. Excellent preowned condition! Very Good Condition. I hope you understand. I might not know exactly what to look for. And, once its sold, its sold. This very detailed pedestal bowl stands 9.5” tall and bowl depth of 5.5” with width of bowl 9”. Scalloped edges, doves, flowers, hearts and butterflies decorate the exterior. No damage to piece. For sale is a Vintage '78 14 PC Hand Blown Crystal Moderno Riekes Crisa Punch Bowl Set w/Ladle. Excellent condition. One small chip around rim of punch bowl. Otherwise very nice. See pictures for reference. Thanks for looking. Rose pattern clear glass with gold accents. Bowl with lid 12" tall. 14" Punch Bowl with SawTooth Edged Rim. And this is Bowl Only. with " Star of David " Design Glass. Depth Height from inside Bowl : 6 13/16" Deep. the spots On the very bottom which would be expected service and very faint scratches on the edge which is also slightly off of the Tables surface. The punch bowl has the saw toothed edge. Perfect condition. Looks like it might be starting to turn slightly purple. 13 1/2" tall x 9" across top x 6" across the base. Up for your consideration is this fabulous punch bowl by Stiffel. Hallmark: Stiffel (pic.4). Type: Pedestal / Footed. This prestigious punch bowl is in excellent condition. Material: Lead crystal. Hand cut crystal made in the Czech Republic. Punch bowl is about 6.5" high. The mouth of the punch bowl is about 9". The cups are about 3" high. The mouth of the cups are about 2.75." Gorgeous set. A must have. Elegant and beautiful 1960's era Punch Bowl and 8 glasses. This is stunning! Perfect for entertaining in style through-out the year.